roasting and getting ready for dinner! 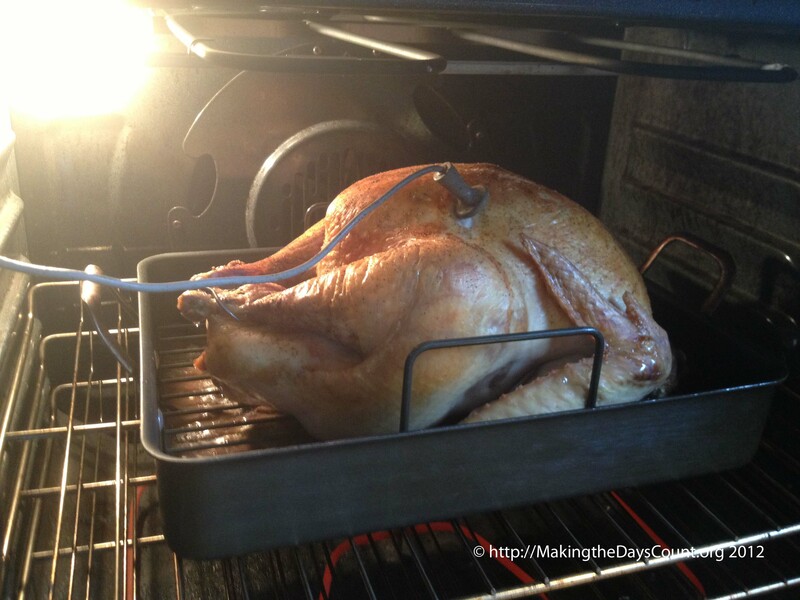 It’s Thanksgiving morning and the turkey is in the oven. There are yams cooking on the stove and it’s pretty quiet. Ivy’s been out a couple of times and she had a treat to start her day. I mixed chicken broth, warm chicken broth, with her dog food this morning and she enjoyed it. Actually, she’s in the doghouse with B, because Ivy woke us up just as the sun was peaking over the horizon. She had slept at the top of the stairs just outside our room and let out a yelp and short bark to let me know it was time to go out. I felt the warm spot on the carpet when I went downstairs to let her out and start the day. Unfortunately, B’s sleep was collateral damage and she followed me downstairs. It’s my job to cook the turkey and it’s in the oven. The smells are just now wafting through the house and before long; the aroma of Thanksgiving will be gently floating through our home. We had planned to visit Ohio and B’s parents, but after much debate, we decided to stay home. We’ll visit at Christmas when there is more time and less stress – at least that is the plan for now. It has been a stressful couple of weeks and all of us needed to rest and rejuvenate without packing and travelling. Over the past several weeks or last month or so, I have felt like I am rushing from one activity to another and not being fully present. I know I have a full plate, and certainly, writing the blog is a luxury – but it helps with my processing. I was in the middle of writing yesterday’s post when we began discussing the decision to stay home. It was foggy and we had a few things to finish before we packed and left. I saved my work and closed the laptop lid. By mid-morning, it was decided and B went to get Thanksgiving fixings – the turkey, the potatoes, and the rest. I mailed Christmas wreaths to family and friends and took O with me to watch W’s wrestling meet: I double-dipped mail and wrestling. It was his first high school match and he won by forfeit. I would have liked to see him wrestle, but that will have to wait for another day, another meet. The original plan was to take off for Ohio when he came home, but our plans had changed and we worked on odds and ends around the house before taking in a movie. The kids saw Rise of the Guardians and B and I saw Argo. It was nice way to end the day and everyone enjoyed a relaxing evening. I especially enjoyed Argo and it took me back to my last year in high school, 1979-80. As a senior, I knew what was going on, but I was caught up in me and not paying attention to what was going on around me. Sort of where I find myself today, some things don’t change, they just look different. Which leads me to today, it’s Thanksgiving. It’s a time to be thankful for life’s blessings. Last year and the year before, I posted my thanks. This year’s thankful list is a bit different. I have much to be thankful for but above all, I am truly thankful for all, which life has to give and I have to give back. I am thankful for the piles of essays and work I need to grade, because it means I am teaching and my students are learning in my classroom. I am thankful that I have to referee between O and W, because it means that they are growing up and learning, though sometimes the hard way. I am thankful for the dishes in the sink, because it means I have food to cook and eat. Also, I am thankful to my mom and dad because they instilled in me the desire to cook and enjoy food. I am even more thankful to the folks with I worked and learned with when I was in the restaurant business. A time long ago and far, far, away. Thank you – Tonette, Chris, Herman, Thomas, Vicki, and many others. I am thankful for the leaves on the ground that I haven’t picked up or the ones that got away, because it means I have a house and a yard and I have work to do outside. It is good to be outside. I am thankful for the guilt about writing letters, because it means that people write me and should get a reply, a timely reply. I am working on that. I am thankful that I can read and write and share my list with others, because it means I can read when many others across the globe cannot. Sadly, there are others who can read but choose not to read, but rather to be entertained. I am thankful that I live in a country that chooses its leaders rather than having its leaders chosen for it. Even as confused as we are politically, I’d rather live here free than anywhere else around the world. I am thankful for the smells invading the house because it means we will be sitting down to enjoy dinner together later today and giving our thanks for each other. I am thankful for all of the things that B asks me to because it means she can count on me to be her partner in the family. I am thankful that you have read this far, because it means you are reading what I wrote and thinking about what it means and matters to you. Yes, I have much for which to be thankful and there is more for which I have to be thankful, but I need to jump up, jump in and seize the day. Today is gonna be a great day, possibly the best day ever. Tomorrow promises to be a million and six times better, but for today, I have the present. Making the Days Count, one day at a time, one moment, one thank you. Happy Thanksgiving and Thank you. What are you thankful for? How will you celebrate Thanksgiving? It’s been a crazy couple of days. Most of the kids are in town for a reunion of sorts. Yesterday was spent eating and a movie (all 18 of us went to see Life Of Pi, 14 of us were disappointed to say the least- I would see it again for the beauty of it and the special effects). Tonight it’s girls night out so The younger men are babysitting while I await my wife. I might wait for her in bed, I am so tired. Good thing these reunions take place only once a year. Oh wait, I forgot abaout Christmas. Think I might take up Buddhism …. we went to a movie Wednesday evening and the kids saw Rise of the Guardians instead of Life of Pi, we saw Argo. There is something about movies over Thanksgiving. I remember watching Terms of Endearment on Thanksgiving break back when I was in college. we had a full house then and full house is a lot of fun, but it takes a lot of energy. Even though we stayed home for Thanksgiving, it’s been full – we are heading home for Christmas and it will be a full house and full time then. As for Buddhism, don’t switch, there would be some Buddhist family celebration which would just drive you over the edge! Tonette – I hope you had a great Thanksgiving… I don’t miss the days when Black Friday meant our eyes at the end of the day. I sure don’t miss the hubbub of the retail in the mall. It’s been a while since I’ve gotten to experience the working end of the day – way back in ’96. I sure don’t miss that part of the job! I do miss the folks – like you and many loyal fantastic guests.